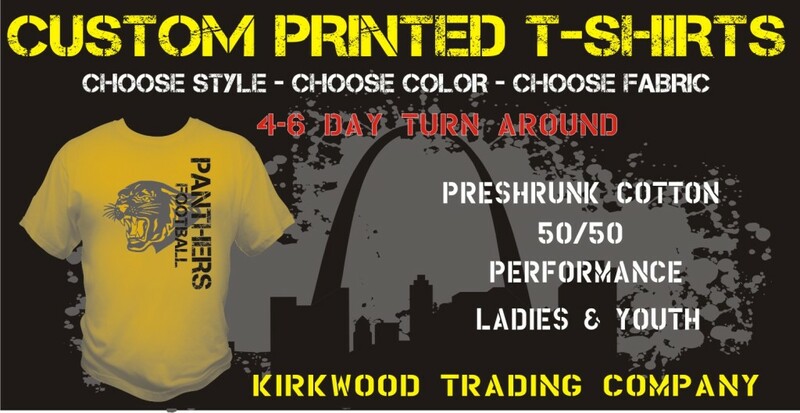 Kirkwood Trading Company is a local St. Louis business specializing in custom printed t-shirts. We offer a full line of apparel from name brands our customers know and trust. Serving the St. Louis area for over 20 years we have the experience to complete any print job quickly and correctly. All of our screen printing services are performed in-house which enables us to have better quality control from one job to the next and we can expedite orders based on priority more easily. Our custom printed t-shirts are typically turned around in 4 to 6 business days. Sometimes we can do it sooner and other times it may be a little longer depending on print needs and shirt availability. Either way when you place your order with us you will know the exact date the order will be completed and ready to pick up, delivery, or shipping. We offer t-shirts from all the major brands that consist of 100% preshrunk cotton, 50/50 blends and the trending performance apparel which is 100% polyester. The current trend is for light weight fabrics and for those fabrics we carry special brands like Gildan’s performance and softstyle apparel, Next Level, American Apparel, and Bella Canvas to name a few. Kirkwood Trading Company carries a full line of men’s, women’s and youth style shirts. So we offer something for everyone including toddler sized apparel as well. While custom printed t-shirts is our specialty, it’s not all we do. In addition to custom tees, we print on sweatshirts, sweatpants, shorts, hats, jackets, blankets, bags, coolers, and much more. In addition to screen printing we also offer embroidery services as well which is the embellishment of choice for polo and oxford style shirts. Kirkwood Trading Company also has an in-house graphics department so if your artwork needs tweaking or you need completely fresh custom artwork, we can help you with that as well. Depending on the extent of the graphic needed, a modest artwork fee may apply. With our history of custom printed t-shirts we seldom run into an order request we haven’t crossed before. Our experience is second to no other companies and our employees are excited to be at work each day. We hire experienced and friendly employees which at the end of the day makes a big difference in the overall customer experience. We boast a 98% customer retention rate which speaks volumes of the quality of our service, customer service, and ability to make customers happy. Custom printed t-shirts is our business. We enjoy it and it shows in the manner with which we conduct our business. We also offer an online quote form for those who just want to get a price without picking up the phone. http://kirkwoodtradingcompany.com/online-quote-form/ Here you can get a price quote on your custom printed t-shirts or any apparel you need customized. However we are always a phone call or email away. Should you have questions or want to place an order feel free to call us or email us at your convenience.